Decent developers wants the best performance from their code. Performance becomes crucial under the .NET Framework, because you're arguably starting off at a performance disadvantage relative to native code. The bottom line is that every serious developer should have a good profiling tool, such as YourKit Profiler for .NET. Yes, it's a naff company name, but its English is probably better than your Russian. YourKit Profiler is a remarkable tool, not least because it's written almost entirely in Java. 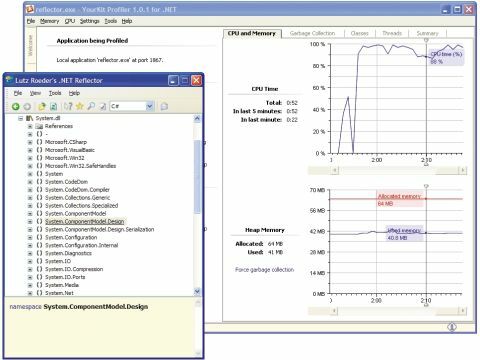 Aimed at .NET 2.0 development, the profiler integrates into VS.NET 2005, but can also run stand-alone. Once you specify a .NET executable and start profiling, you'll see a real-time display of CPU and memory usage. Another tab shows time spent in the garbage collector, how many collections have taken place recently, and more. For more detailed info, the profiler allows you to take a snapshot of the running process; this is automatically saved and can be subsequently reopened for comparative purposes. Within the snapshot, you can view a hotspot listing, showing the methods where the application spent most of its time. You can also see a call tree - either merged or arranged by individual thread - and view back traces of individual methods showing where they were called from. The ability to 'deobfuscate' a masked application is particularly useful. This works with the popular Dotfuscator .NET utility , as long as you pass the obfuscator's log file to the profiler. The advantage is that you can work with the same obfuscated executable that you supply to customers.